This month’s featured cheese maker is Sid Cook of Carr Valley Cheese. Carr Valley is arguably Wisconsin’s most prolifically successful cheesemaking company. With over 100 different kinds of dairy products and close to 800 national and international cheesemaking awards, it is hard to view Carr Valley as anything other than incredible. Founded in 1883, Carr Valley Cheese has been making handcrafted cheese for over 125 years. Now, four generations down the road, Sid has taken cheese making to a whole new level. Back in 1982, Sid Cook saw an opportunity to make something other than what was mostly produced back then and createdCarr Valley’s first artisan cheese. 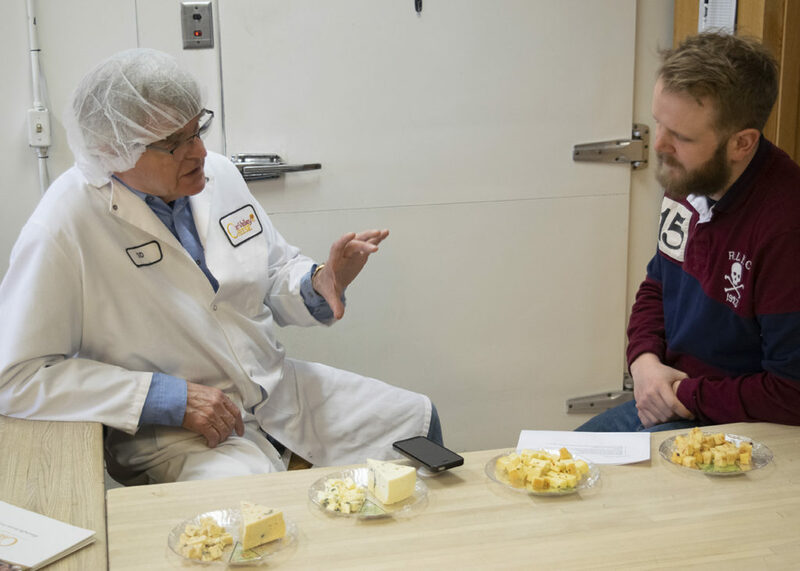 It can be argued that his vision and desire to innovate with cheese has paved the way for future generations of cheese makers, and has helped shape the recent artisan cheese movement, as well as redefining the landscape of cheese making in the state of Wisconsin. Carr Valley Cheese prides itself on using only locally sourced milks of the highest quality and from trusted farmers. They make close to 5 million pounds of cheese every year. Sid Cook is a very hard man to pin down. He makes daily rounds of all four cheese production plants to oversee production. His never wavering dedication to his passion is a strong indicator of the kind of man he is. After over 50 years of cheese making, Sid is clearly as dedicated as ever and much to our relief has absolutely no intention of retiring any time soon. Meaning that we will be able to enjoy his innovative cheese making for many more years to come. We were lucky enough to be able to sit down with him and his national sales rep, Elle Fearing after a guided tour of their LaValle production plant. We were then treated to a cheese tasting that would put all other cheese tastings to shame. “Well, years ago, growing up in a cheese factory, we made Cheddar, Colby, Monterey jack and muenster. I always thought that if I had an opportunity to sell other cheeses, I would sure like to make them. And so, back in about 1982, we made our first artisan cheese. I had an opportunity to sell it but I didn’t have a store where I could do the things I wanted to do. So in 1986 I bought this factory and had a small cheese store. That enabled us to start making a lot of different things, because back in those days, people buying cheese from us would never want to buy a goat or sheep’s milk cheese. It was having a market, having people interested in these different kinds of cheeses that gave us the inspiration. 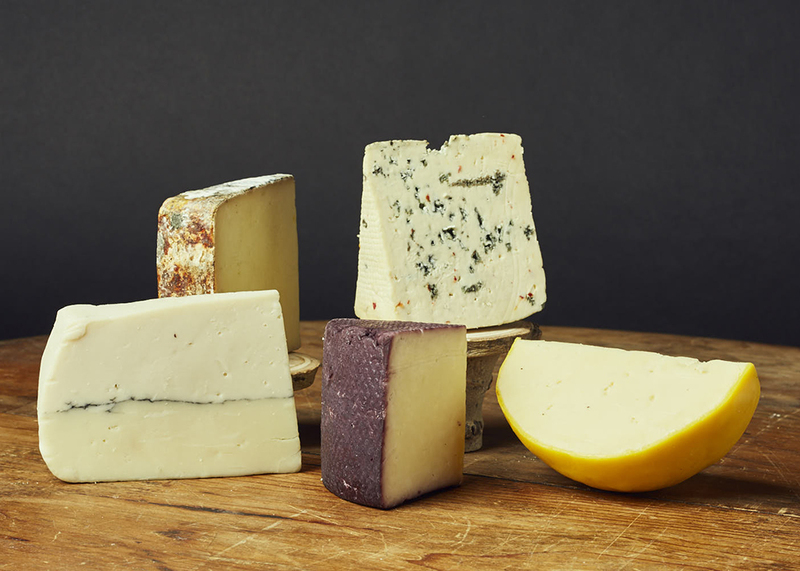 When we first started making artisan cheese, we started by sending out samples to chefs. And then we made it onto their menus. And the people we sold our cheese to (Colby, Cheddar, Monterey…) weren’t interested in buying our artisan cheese. There really was no market for it. We had to make the market. A lot of chefs started coming to our stores to buy our cheese and that’s kinda how it all started. Of which Carr Valley cheese are you most proud? We make over 100 different dairy products and so it depends on a point in time. The Mobay is a fantastic cheese, it’s a pun on the French cheese Morbier, we do a layer goat milk and layer of sheep milk separated with a line of ash. Whereas the Morbier is just cows milk. It’s a completely different cheese. The idea behind separating the goat and the sheep was to give the cheese three different flavor profiles. It’s a beautiful looking cheese, you can really see the difference between the two kinds of milk used. The first time we had shown the cheese was at the American Cheese Society in San Francisco, and the reason it didn’t get best in show was because they thought something was wrong with it because of the two colors! They didn’t realise it was sheep and goat! We’ve got some really great cheeses, we love our bread cheeses, we’ve got excellent blue cheeses, and we do a great job with our goat milk cheeses. To date, we are at about 771 national and international cheeses and we just won 11 at the US contest. With all the awards we’ve won we kind of limit ourselves to the number of competitions we enter. We don’t enter American Cheese Society anymore. Our best showing there was 29 awards. That year the entire state of California got 32, Carr Valley got 29. Carr Valley is essentially its own cheese state! We’ve got a bunch of really great products, and so I’m proud of about 50 of them. The Cranberry Chipotle is excellent, the Cocoa Cardona, we do a great job with our truffle cheeses. Our bread cheeses are excellent. We’re coming out with reserve Gouda and reserve cheddar. Both of those are amazing. We’re very proud of our smoked cheeses. We’ve been very innovative with these cheeses. We’ve had a smoker for 25 years. We do cold smoking. In 1999 I got a fire lit under me, and I was going to do all these other cheeses because by then we had two or three stores and we could really market and have a reputation for great product. Really start selling. Which Cheese was the hardest to perfect? Probably the Maustoner. That is a really, really great cheese. It’s kind of an in-between Gouda and Baby Swiss, it has some flavored notations of both cheeses, and it’s just really a pretty wonderful cheese that’s been around for around 25 years, but has only really taken off in the last six months. To what would you credit your prolonged success? 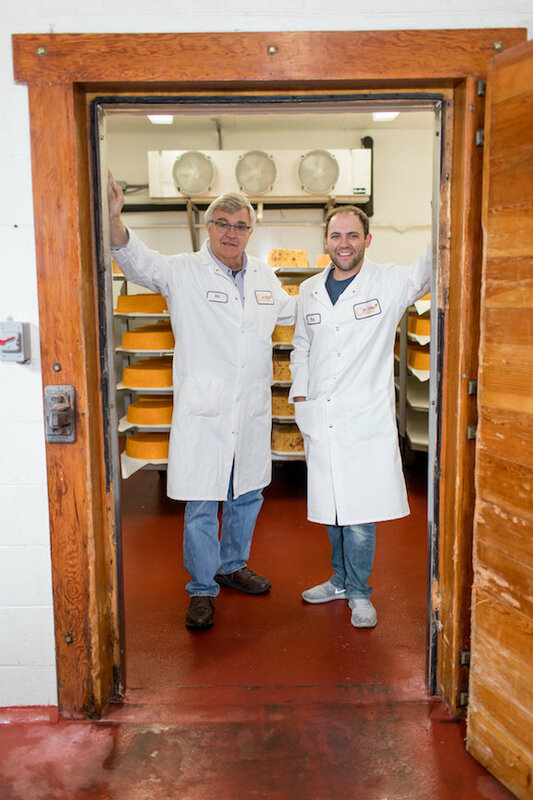 There are a lot of great people and cheese makers that work with us. So many master cheese makers only get to make one or two cheeses, a lot of the people that work for them are in the same situation. 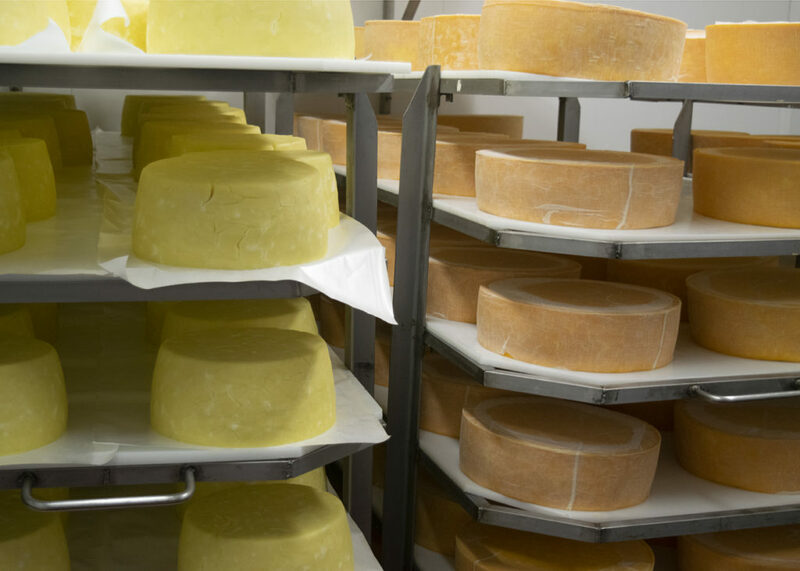 Our cheese makers on the other hand are really happy about what they do because they do so many different things. That makes work so much more interesting day after day. We’re very hands on too. Can you sense a change in the way that people consume cheese and the flavors they are looking for? Oh, sure! I think people are more and more conscious about calories. If you’re going to consume calories, you might as well want it to taste good. Why would you go for a slice of Mozzarella when you could have something that really tastes good? It just makes sense! If you’re going to have 20 people around a table, there will be 5 different favorites, everybody else is going to line up. Several people won’t try the blue cheese, some people won’t like anything with pepper or truffle. Having a variety is important because then you have something for everyone. It must be an exciting time to be making cheese. Yes! It’s awesome. It’s awesome for us. But it might not be awesome for the person that is making 20 pounds once a week and trying to sell it at the local farmer’s market. It’s not great for a person that has spent 300 thousand dollars on a new farm, did all the regulatory thing, put the milk into it and then they have to go age and sell the product. It is a real eye opener, because everybody thinks that there is a lot of money in the cheese business, but it’s really slow money. It’s a lifetime commitment, not the sort of thing that you can just jump in and succeed. It’s not like software, it’s slow going. We have some cheeses that aren’t sold yet but that are 18 years old. What’s next for Carr Valley? Well, we’re doing butters. We are also doing the reserve Gouda and reserve Cheddar. That’ll be pretty beautiful. The label will be embedded in the cheese. You’re a 4th generation cheese maker, will you be able to pass it on? We have a few step kids in the business, we’ll see. But I’m really not thinking about passing it on right now, I’m having fun. There are still plenty of things I want to do. I’m not thinking about cashing out yet. I mean it would be great if it could continue because we’ve got a lot of really good young people. We’ve got a young master cheese maker. We have people of all ages involved. We’ve even got some 14 year olds that are selling cheese here on the weekend. That’s actually how I got this gal here (points to Elle), she was selling cheese here when she was 14. She went off to college and I said, “When you graduate, let me know because I have a job for you”. It worked out pretty well! With our master cheese maker, it’s the same thing. He wanted to go to college to study engineering. When he thought about quitting, I told him “If you finish, I’ll hire you”. It’s important to surround yourself with intelligent people. Do you still have creative control over the recipes? Oh yeah! At least I think I do. Every once in a while somebody is changing stuff or doing something that they shouldn’t be doing and we’ve got to catch them. What can you tell us about your relationship with Fromagination? I like Ken, what’s not to like? Very likeable! I’ve been in the store a few times but I try to stay out of Madison. I prefer the countryside, no traffic, I like a nice, quiet life. I’m not real big on cities, so I don’t get out all that much. I think he’s got a great store; I think it’s a great thing he does sandwiches. Fromagination really represents what’s going on, he’s done a really nice job and good for him”. For someone who has won as many awards as he has and been making cheese as long as he has, Sid Cook is clearly as passionate as ever about cheese. After our conversation, he comes across as someone who genuinely cares about the products he creates as well as the people who work for him. He encapsulates what it means to be an artisan cheese maker and thanks to him, Carr Valley is its own cheese State. 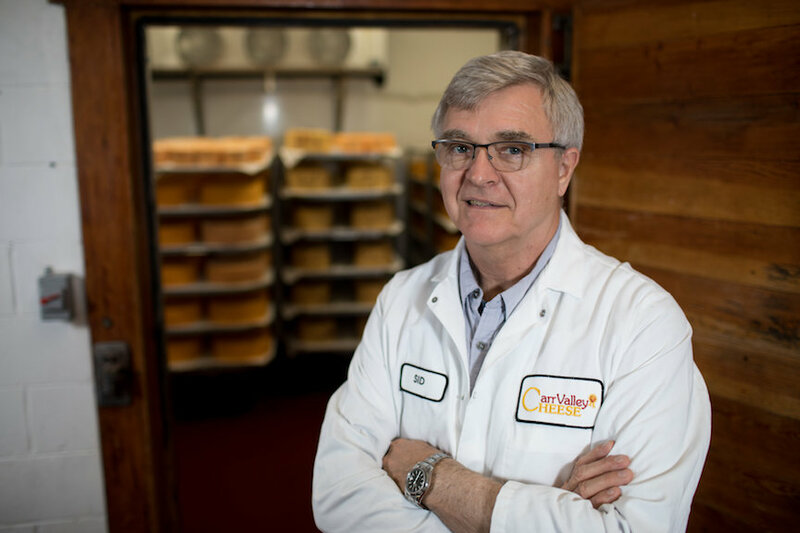 We are proud to have him as Fromagination’s Featured Cheese Maker of the month.